Euro-Mid Observer for Human Rights said that the Supreme Court in Madrid ordered the arrest of ex-foreign minister Avigdor Lieberman, ex-defence minister Ehud Barak, the then-deputy prime ministers Moshe Ya’alon and Eli Yishai, and former state minister Benny Begin, as well as Netanyahu. It also ordered the arrest of Israeli Navy Commander Eliezer Marom, who is among the co-defendants found guilty by the Spanish judge. 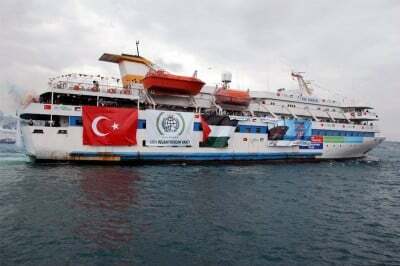 According to YaniSafak website, the investigation into this case was launched after Spanish activists on board the main vessel in the flotilla, the Turkish-registered Mavi Marmara, filed a criminal complaint against Israeli officials involved in the raid. YaniSafak said that in June a Spanish court dropped a five-year-old investigation into the raid, but it left open the possibility that the case could be reopened if the specified Israeli officials visited Spain. Although the case was sent to the Supreme Court, continuous Israeli pressure slowed down the investigations. Nevertheless, said the news website, the judge has sent the list of defendants to the Spanish police, demanding the start of the legal process to issue a red notice for their arrest. Israeli naval commandos killed nine Turkish peace activists, including one with dual American citizenship, and injured dozens more on board the Gaza-bound Mavi Marmara. Spanish activists also took part in the flotilla, which was attempting to break Israel’s illegal blockade of the territory.